A classic cRPG based on the fifth edition of the Dungeons & Dragons tabletop system. The game was created by Digital Extremes, a seasoned developer, under the auspices of Wizards of the Coast. The game is based on the titular Sword Coast universe, known to PC players from e.g. 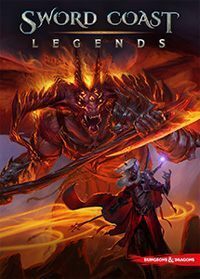 Sword Coast Legends is a classic-style RPG based on the fifth edition of Dungeons & Dragons system. Studios Digital Extremes and n-Space developed the production, whereas Dan Tudge, who was previously an executive producer on Dragon Age: Origins, supervised the project. Wizards of the Coast, the publisher of D & D, oversaw the entire venture. A fundamental part of Sword Coast Legends is the role-playing campaign for individual players. The story takes place in a fantasy world of the Forgotten Realms, in the region called the Sword Coast. This is the area featured in series such as Baldur's Gate and Neverwinter Nights, but shown over a hundred years later. In terms of gameplay mechanics, the game bears more resemblance to the latter of these series – the world is presented in three dimensions, with the option to freely manipulate the camera. We fight in real time, but nothing prevents us from using active pause to calmly think through the commands for the team (which consists of up to four characters). We start the game by creating our own hero, choosing one of the five races and six classes taken straight from to the fifth-edition manual of Dungeons & Dragons. The game provides the option to play the story campaign in cooperation with three other people or take part in separate adventures in Dungeon Master mode for up to five players. In this mode, four participants assume the roles of heroes, while the fifth oversees their actions as the Dungeon Master. He or she can place traps and additional opponents on the team’s path, but also stage NPC encounters and enrich the locations with hidden areas. Developers have prepared a set of ready-to-use scenarios (which can be adjusted by the Dungeon Master before the adventure begins), as well as a powerful, yet user-friendly editor that allows you to create your own adventures or even entire campaigns from scratch. In terms of the quality of visuals, Sword Coast Legends does not stand out too much from other classic 3D RPGs released during roughly the same period (e.g. Divinity: Original Sin). The graphics don’t provide a breathtaking level of detail, but they are aesthetic and atmospheric. The guide to the Sword Coast Legends game contains a detailed walkthrough for the game and a full set of advices that will help you in completing the title in one hundred percent.